A food served as both an appetizer and main meal. 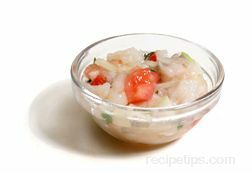 It is made with a combination of raw fish, vegetables (such as tomatoes, bell peppers, cilantro, green onions, and white onions) and marinated in a base of citrus juices with seasonings. The mixture is marinated for 36 hours or so, allowing the acid in the juice, which is often lime or lemon juice, to create a chemical reaction with the raw fish turning the meat of the fish into a firm texture with an opaque appearance. A traditional dish of Latin American countries, Seviche is commonly made with half-inch thick pieces of fish that may be pompano, yellowfin tuna, red snapper, sea bass, sole, or shellfish. Seviche is often served as an hor d'oeuvre, served as a main dish placed in pastry shells, or combined with pasta and made into a salad. Seviche is also known as Ceviche or Cebiche.